Do you have suggestions for resiliency case studies to include on the Resource Center? Let us know about them by filling out this brief form here! The Boulder County Collaborative received CDBG-DR funds from HUD for work that addresses the long-term disaster recovery needs from the 2013 floods. As part of their responsibilities in administering this funding, the Collaborative needed to develop resilience performance standards for any infrastructure projects the funds would be used for. 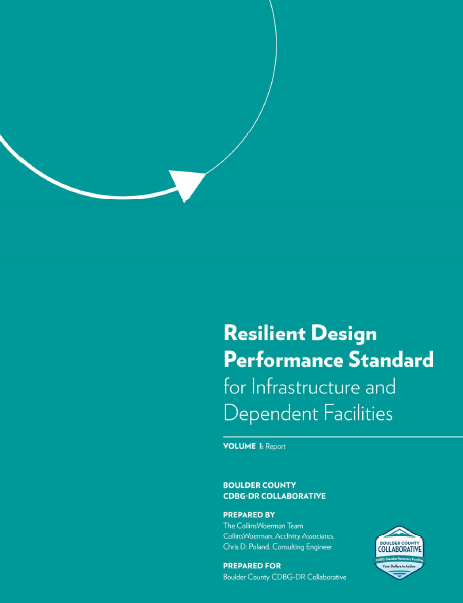 To address this requirement, the Boulder County Collaborative set forth on developing the Resilient Design Performance Standard. The Colorado roadway network suffered severe damage from the 2013 floods exceeding $700 million to Federal Aid-eligible facilities alone. Following this extreme weather event the Colorado Department of Transportation sought to identify design alternatives that would increase the resilience of the affected sites. In particular, they sought to address their vulnerabilities to future shock events through comprehensive analysis and integrated design approaches, which help mitigate and minimize future losses. Larimer County communities developed the Larimer Community Resiliency Framework, a regional resiliency framework to build local resilience to future shocks and stresses. The Larimer County framework established a collective vision and goals for the county, participating municipalities, and community-based organizations, examined existing conditions across six resiliency sectors, and developed actionable strategies and priority projects to address vulnerabilities. Dams provide essential services that are often unseen to many. However, large amounts of water may be released even when dams are functioning properly due to intense rainfall, rapid snowmelt, or other unanticipated circumstances. This can result in flooding to downstream communities. Colorado Dam Safety developed the Colorado High-Hazard Dam Release - Downstream Floodplain Impacts Database and Ranking Tool to better understand where communities are at risk from dam releases and help identify and prioritize alternative floodplain mitigation and emergency preparedness solutions. 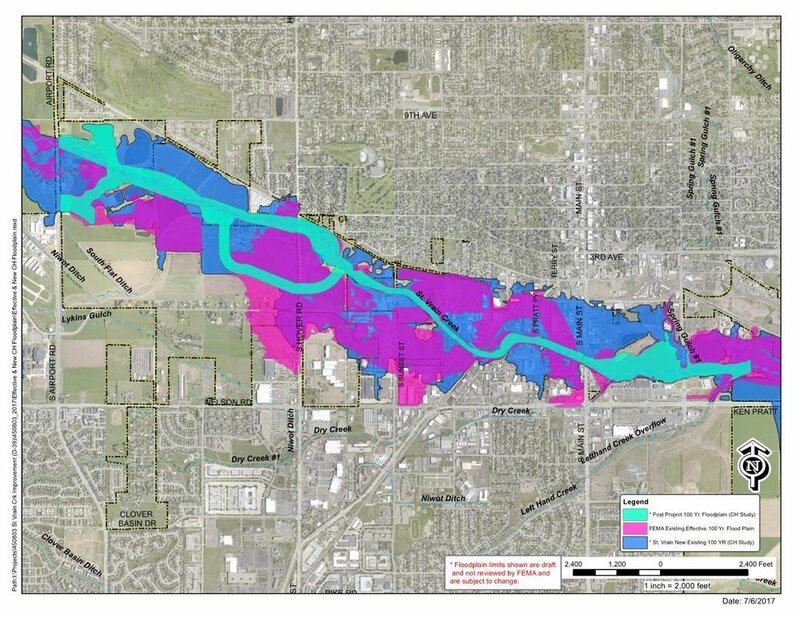 When the 2013 floods came, officials’ fears came true and Longmont experienced significant flooding throughout the city, particularly areas along the St. Vrain Creek. The most significant flood event in the city’s history, the devastating floods damaged and destroyed hundreds of homes, businesses, and public areas. Longmont knew that it had to start taking action right away to make the Creek, and the community, more resilient against future flooding events if it wanted to avoid similar losses and damages. The Colorado State Forest Service Nursery (the Nursery) is located in Fort Collins on CSU’s Foothills Campus, and produces seedlings and shrubs that are native to Colorado for conservation and resiliency purposes. Across its 130-acre facility, the Nursery staff grow seedlings for over 50 species of trees, plants, and shrubs, and then sell these products to both public and private landowners throughout Colorado to assist in conservation efforts. The Nursery is one of only five state-managed nurseries in the country, and carries out its operations in over 18,000 square feet of greenhouse space for propagating plants from seed. Wheat Ridge is a city of around 31,000 residents located in the suburbs of Denver. For the past seven years, the City has used priority based budgeting when developing its annual budget. Using a priority based budgeting process has allowed the City to align its resources and assets with budget priorities to link financial needs with the City Council’s Strategic Goals. The Colorado Department of Human Services (CDHS) is taking a two-generation, or 2Gen, approach to all of the services it offers to help families escape the cycle of poverty. Through its 2Gen efforts, CDHS works to serve families as a whole rather than focusing solely on children or caregivers, helping to increase the likelihood for families meet their full potential and achieve economic stability and security.